From local cafes and boutiques to shopping malls and corporate events, charging stations are a great way to help bring in business and establish brand loyalty with customers. Depending on the size of your business, the type of station you choose will vary. For small, local businesses, a large and pricey charging station might not help you as much as hinder you. Veloxity offers small, portable charging stations that are perfect for spaces that might not offer a ton of leg room. Small spaces can benefit by prominently placing a charging station at the end of the countertop where customers can plug their phone in without asking the barista or salesperson to keep an eye on it. This frees up your employees to serve customers without distractions, and it gives your customers an extra boost while they sip their latte and read the paper. Businesses that have a lot of traffic, like bars and restaurants, might want to consider a larger locker charging station that can charge many phones at once. Locker charging kiosks are fantastic for restaurants because they let customers plug their phone in when they arrive and then enjoy a distraction-free, family dinner without worrying about the safety of their phone. Locker charging kiosks are also great for bars where you can store both your phone and your keys. It helps keep those who might have had a few too many drinks from driving home, and it ensures their phone will be ready to call an Uber at the end of the night. If you own a bar, you might consider a locker station with a keypad, which will allow customers to access their phone without needing to close out their bar tab or wait until closing time to get their phone back. Retail stores can also benefit from providing charging stations as they drive new customers into the store and encourage them to shop while they charge. In fact, one study showed that customers that charged their phone at an in-store charging station browsed twice as long and bought almost 29% more in merchandise. Of course, in stores the size of the space is a huge factor in your decision. Small boutiques will probably want to save space and provide a small, portable station, while shopping malls can strategically place locker charging kiosks throughout the vicinity. When it comes to big events, phone charging stations are a must! Festivals, concerts, conferences, and trade shows are all usually held in larger spaces with lots of people in attendance. 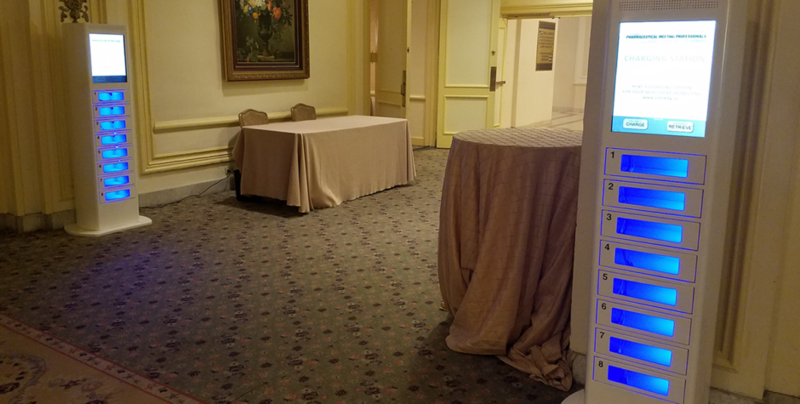 Venues will probably want to go the locker route and may even want to consider having several charging stations throughout the event space. Have one in the lobby for those just arriving, one near the restrooms, and another right next to the merchandise. Having charging stations at festivals, concerts, conferences and trade shows is important because many people want to take videos and pictures of the events taking place and with a dead phone there is no way to do that. These pictures and videos people take and share of your event will become unpaid advertisement. For those that attend conventions and trade shows, providing customers with a portable charging station on top of your table is a great way to pique their interests and pull them in. While customers charge, you’ll have the opportunity to chat with them more about your products. For certain locations, phone charging stations are more of a necessity than a simple convenience. Hospitals, physical therapy offices, airports, and universities can all benefit from providing charging stations that help patients, passengers, and parents stay in touch when they really need to. In hospital waiting rooms, locker charging stations allow family members to reach out to loved ones with important updates, while airport terminals can benefit from kiosks that help travelers update family and friends about their ETA. Since both places tend to be crowded and hectic, locker charging stations are the best choice to keep multiple phones charged at once. They allow customers to walk away from the station, clearing up room for more people to also charge their phones, rather than having everyone huddled around the closest outlet. It’s a great way to ease the stress of these places, as well as an excellent chance to advertise your products and services. College students might not be known for calling their parents back right away, but they do tend to spend a lot of time on their phones. At most schools, students don’t have access to landlines or pay phones, which means cells phones are even more of a necessity on campus. Locker charging stations can be placed in the library, academic buildings, and even along walkways and campus green spaces to make sure students can always stay connected. For these stations, you can even have a student ID card reader that allows students to access their phone with one swipe. There are a lot of phone charging station options out there, but once you consider your location, your customers, and the type of product you’re offering, the choice is much easier. Get started today and begin reaping all the benefits that mobile charging options can bring to your business.